Special one-shot issue illustrated by Alise Glu�kova (Abe Sapien)! A brilliant surgeon and a brilliant software engineer must be convinced to join a manned mission to the asteroid belt, crucial to the survival of the human race. The problem-it's a one-way trip, they both know it, and they both quite like their lives on Earth. 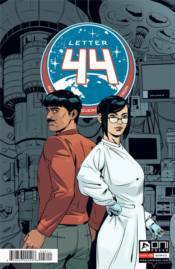 Learn how Manesh Kalani and Kyoko Takahashi were recruited into the Clarke crew, in an issue designed to fill in crucial puzzle pieces in the Letter 44 saga!